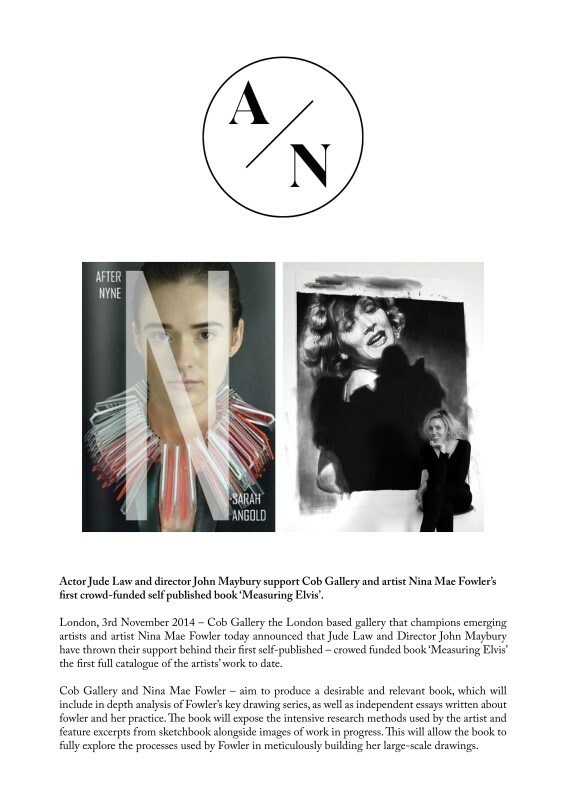 London, 3rd November 2014 – Cob Gallery the London based gallery that champions emerging artists and artist Nina Mae Fowler today announced that Jude Law and Director John Maybury have thrown their support behind their first self-published – crowed funded book ‘Measuring Elvis’ the first full catalogue of the artists’ work to date. Cob Gallery and Nina Mae Fowler – aim to produce a desirable and relevant book, which will include in depth analysis of Fowler’s key drawing series, as well as independent essays written about fowler and her practice. The book will expose the intensive research methods used by the artist and feature excerpts from sketchbook alongside images of work in progress. This will allow the book to fully explore the processes used by Fowler in meticulously building her large-scale drawings.